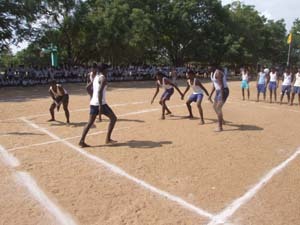 The annual sports meet was held on 11.01.12 as part of youth day celebrations. The meet started at 8.30 am with a prayer. 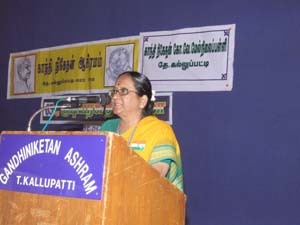 The guests and others were welcomed by Mrs P Thilagavathi, our Head mistress. 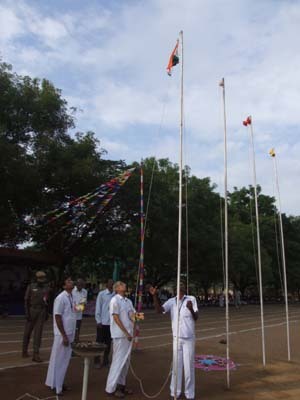 The national flag was hoisted by our chairman, Prof R Venkataswami. 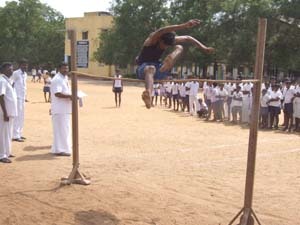 The Olympic flag by Mr Babu, Subinspector of Police, Kallupatti. 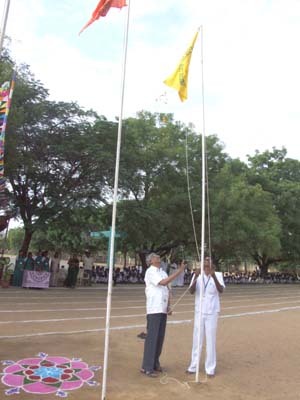 Ashram flag by Mr PS Uma Maheswaran, local block development officer, our school flag by Dr V Ragupathi, member of the managing committee and former secretary of Gandhiniketan Ashram. 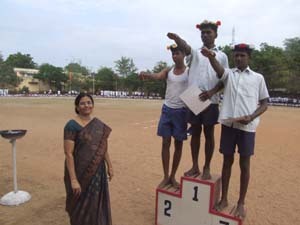 Following this Dr Murali Rajan, Medical officer of local PHC, took the salute of the march past by our NSS, NGC, Scouts, JRC and the athletes belonging to various houses of the school. Nearly 12 of events were conducted. 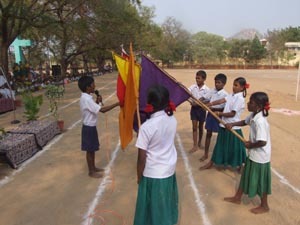 The children cheered all the winners and the staff members were in full form in conducting events. 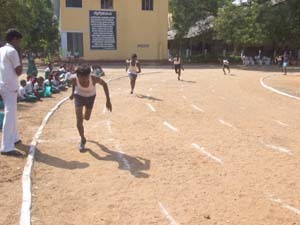 The physical education department team consisting of Mr Kandaswamy, Mrs Pankajam, Mr Murugan and Ms Kamalaveni are to be congratulated for the orderly conduct of the events with the help of their colleagues in the school. The events ended with a walking competition and musical chair in which the staff and guests participated. 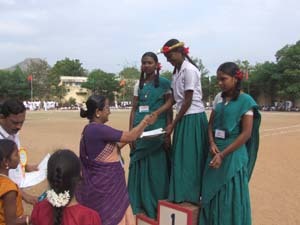 Later the prize distribution ceremony was started at 3.30 pm with a prayer. Our chairman welcomed the chief guest Padmashri Dr. P Namperumalswamy, honorary chairman. 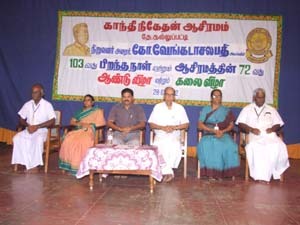 Arvind groups of hospitals, Madurai. 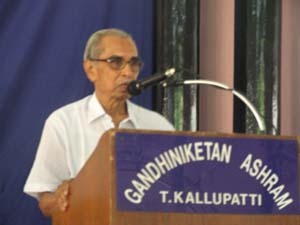 In his welcome address the chairman said that “Dr P Namperumalswamy is one of the hundred most important people in the world as per the time magazine of United States of America. 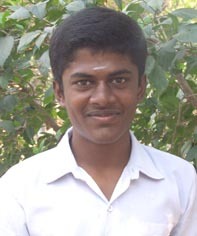 The students should emulate him as a role model. 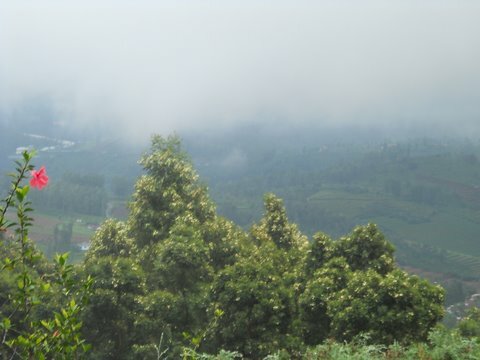 Dr P Namperumalswamy, had a humble beginning from a village and rose to this position. 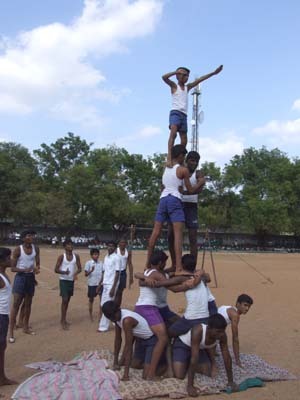 In addition chairman said “sports will soon become part of the examinations. Students must have physical activity to have a healthy mind. 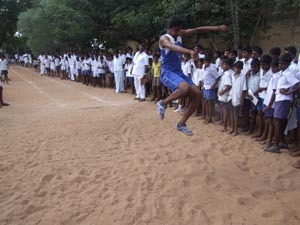 This type of sports will foster cooperation and better understanding among the students”. 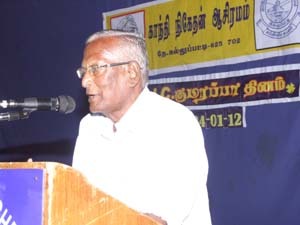 Dr P Namperumalsamy in his address exhorted the students to utilize the modern opportunities to come up in life. He cited his own life as an example. 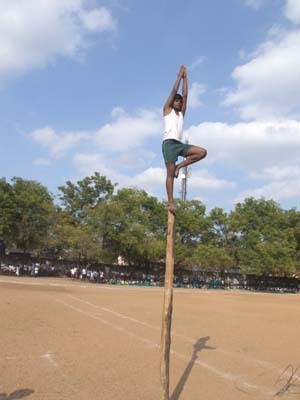 He advised the students to take up sports in a big way as this gives a healthy mind in a healthy body. He wanted the students to strive for excellence. 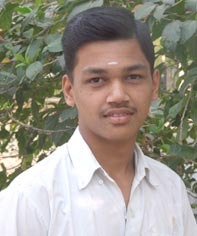 Irrespective of social background everyone can come up in life. Later he gave away prizes to the winners. 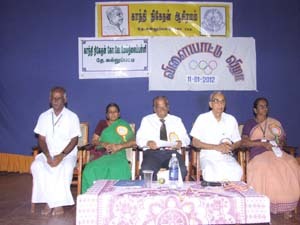 Earlier Mrs P Thilagavathi in her introductory remarks welcomed the chief guest and others. 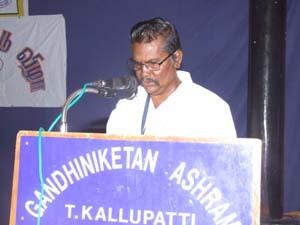 Mr Kandaswamy, head of department of physical education read an annual report. 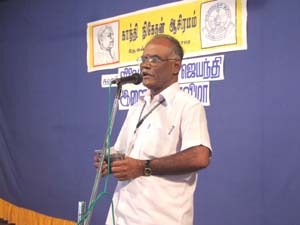 The function ended with national anthem presided by a vote of thanks by Mr Kandaswamy. 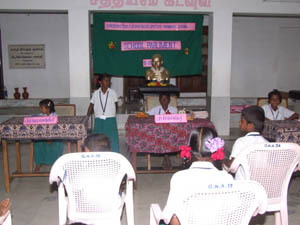 The 150th birth anniversary of Swami Vivekananda was celebrated as national youth day in our institution. 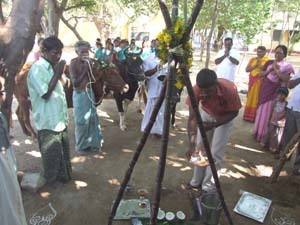 The celebrations started at 10.30 am with a prayer. 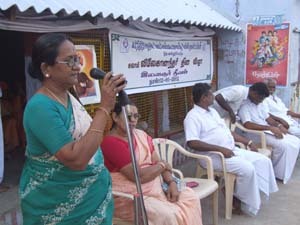 Mrs P Thilagavathi our Headmistress gave an introduction about Swamiji and appealed to the students to follow the foot steps of this great saint of our country. 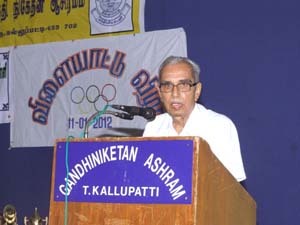 Our chairman, Prof R Venkataswami in his special address narrated several anecdotes from the life of Swamiji. He said that Swamiji was a great nationalist as much as he was a “Sanyasin.” Swamiji wanted the youth of this country to have a scientific mind in accepting any issue. He stressed the need to be fearless in one’s own life. Youth should develop intense focus on whatever they do. 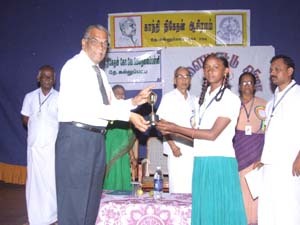 Earlier our chairman Prof R Venkataswami distributed prizes to the winners of various competitions held on topics centered on Swami Vivekananda. 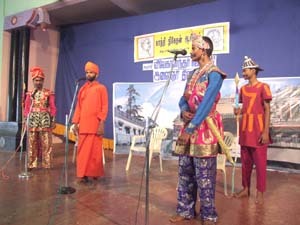 Later a cultural programme was enacted by the children of both the schools. 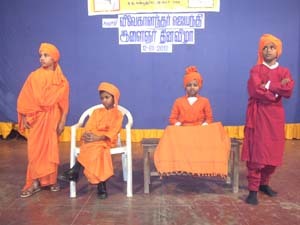 The primary school children dressed in Swamiji’s attire came up on the stage, which was indeed applauded by one and all. 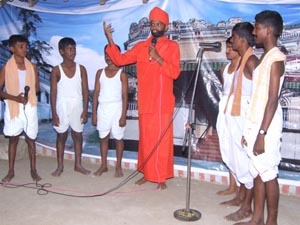 Mr Raj Kumar ,oura physics teacher and Mr G Thangamani our tamil teacher directed a drama, narrating a few incidences in the life Swami Vivekananda. Mast Mari Gandhi and Mrs Aruna our English teacher gave scintillating songs. 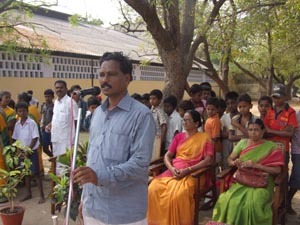 Mr Nagajothi our HM in primary school proposed a vote of thanks and with national anthem the function ended. 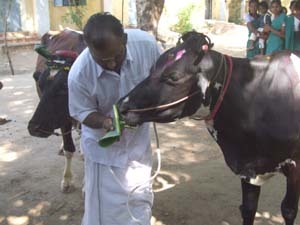 Cattle Pongal celebrated in our dairy unit. 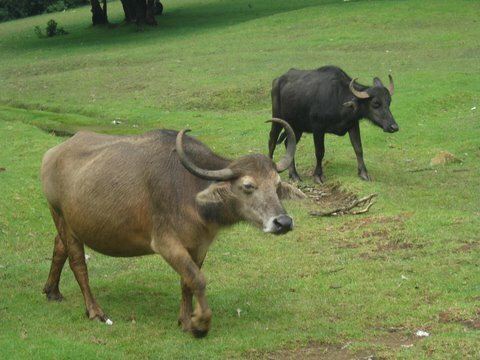 Cattle were washed and their horns were painted with color. 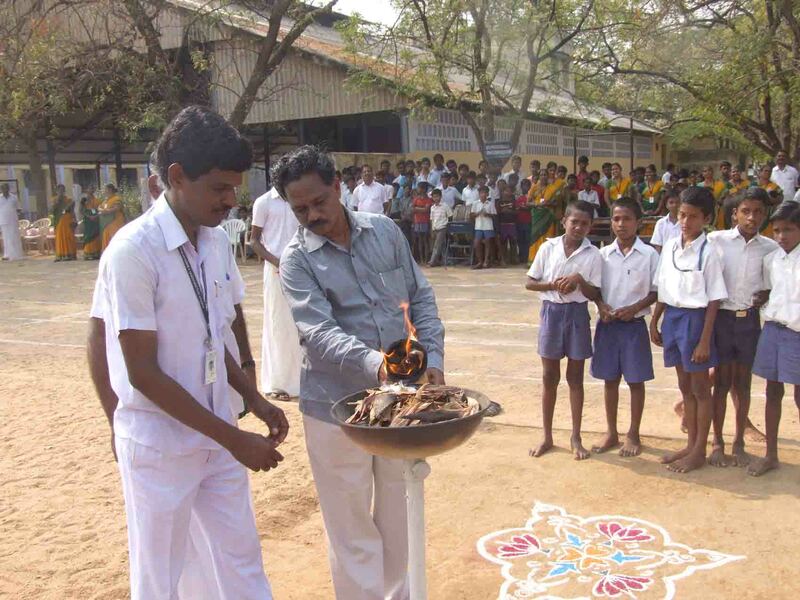 Pongal was prepared and after pooja cattle were offered Pongal, Sugarcane and fruits, Some of our teachers office people and dairy unit students attended the celebration. 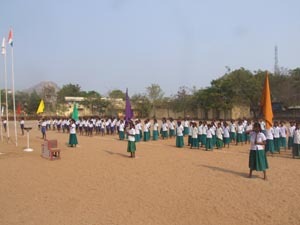 63rd Republic day celebrated. 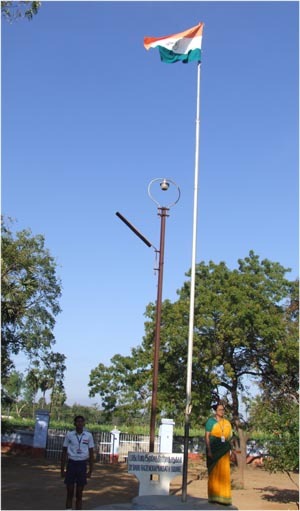 National Flag was hoisted at 8.30 am by Ms.Thilagavathi HM. In her special message she explained what Republic stands for and the responsibilities of good citizens. 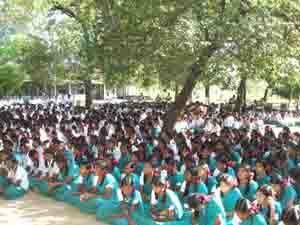 She appealed to students to strive hard to the development of our country. 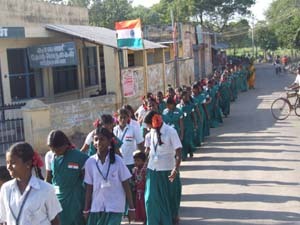 A procession was conducted by Higher secondary students. 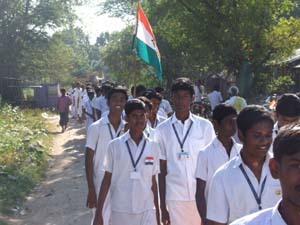 On their way they raised slogans to create awareness among the public about the importance of the day. A special meeting was conducted at 10.00 am in the auditorium. After prayer Ms.P.Thilagavathi, HM, in her inaugural speech described how our ancient tradition, culture and heritage has made great impact on other countries. 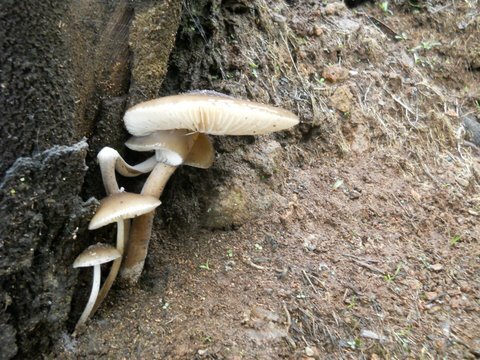 They are now following our yoga and meditation in scientific way and prove them as better means to lead successful life. 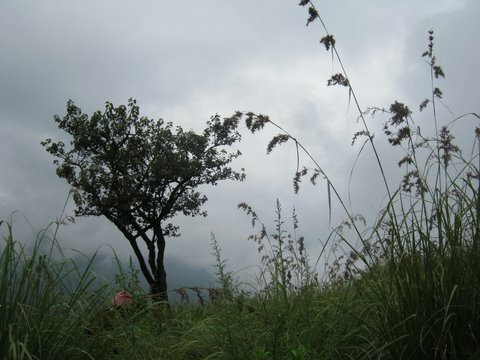 We as Indians should cultivate and practice good virtues which we have acquired from our ancestors. 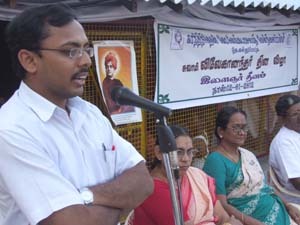 K.Vignesh babu V. Std spoke about Republic in English. 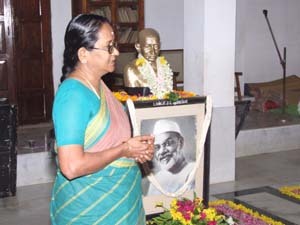 R.Pavitha XI – A spoke about the salient feature of Republic Mr.N.Ramanisekar in his special address pictured how Dr.Ambedkar framed our constitution with all his brilliance and experience. He also pointed out the plight of some of our children who are suffering in match factories and hotels. 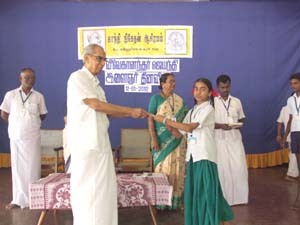 Primary school students staged a dance and Marigandhi sang a song. 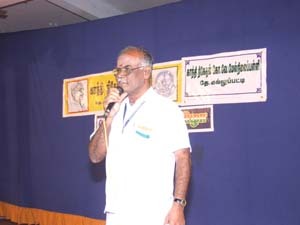 With the vote of thanks by Thiru.Nagajothi Primary HM the celebration came to an end. 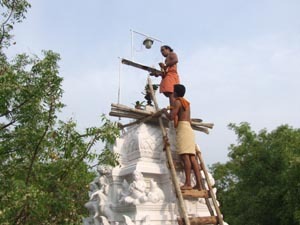 Gandhiji Memorial Day was observed as Martyr’s Day and Sarvodya Day. Special prayer was conducted at Gandhimandapam at 6.00 am. 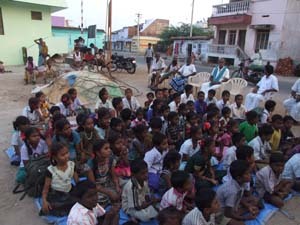 All local teachers, Ashram workers and hostel students attended the prayer. 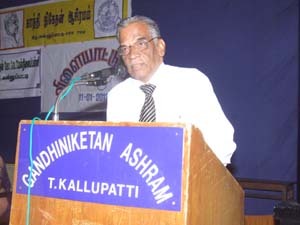 Ashram President Prof. Venkataswamy gave special message through Skype Video conference. 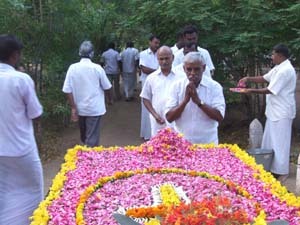 The day happens to be Dr.J.CKumarappas memorial day also. He recollected how the two great souls have sacrificed their valuable life to the service of humanity. He quoted incidents from Gandhiji’s life which transformed an ordinary Mohandass into great Mahatma. 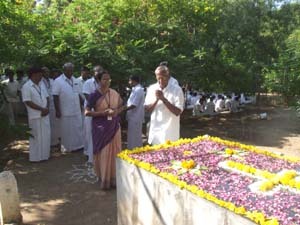 The prayer followed by floral tributes in J.C.Kumarappa memorial ground. Later a meeting was conducted in the auditorium at 9.00 am. Mr.Muthuramalingam AHM conducted the meeting as HM has gone attend CEO meeting in Madurai. 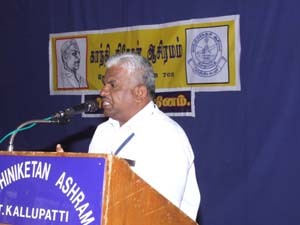 Thiru.Iraiyanbu IAS delivered a speech about Mahatma Gandhiji’s great contributions to our freedom and equal status to all human beings. India is one of the largest democracies in the world. The basic principles of democracy should be made known to our children from their early years. With this in view we in our primary school organize mock parliament. The children are briefed by the staff about the t election process and they elect their speaker, the Prime minister and other ministers. The students of fourth and fifth standards poll their votes according to their choice. This system is being followed in our school for the past several years. 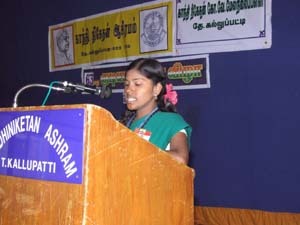 This year Subashini was elected as prime minister. 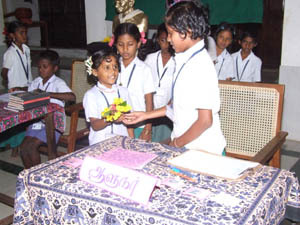 Alaguselvarani, Abinaya shri , Saranya , Balachandran ,Aiswarya were elected as Ministers of education ,food, Agriculture , sports ,and health respectively.The parliament is convened thrice in a year. Teachers and students are the observers of the election process .The honorable Speaker presides over the parliament meeting. The secretary documents all the parliament proceedings and the resolutions. This year the following resolutions were passed after discussions. 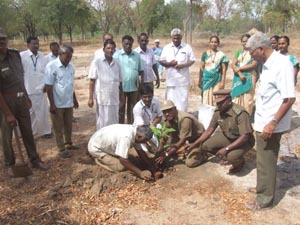 Resolved to maintain clean and green environment in the school. Prevent the unnecessary roaming of students during the study hours. Finally the speaker declared the house “sine die” for the year. As part of chief minister’s birth days celebrations the forest Department came with a proposal to plant 600 trees in our land and campus . 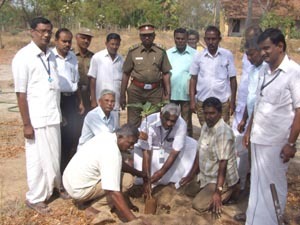 The forest department team consisting of Mr. Duraisingam brought 600 saplings . 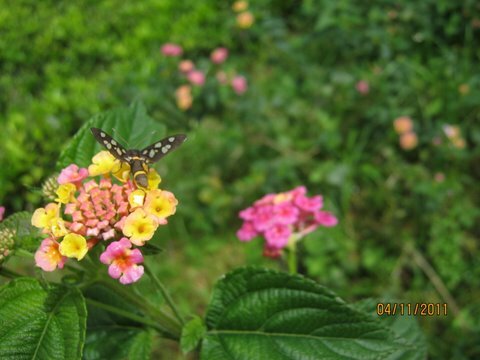 We chose trees with wood value for our leather industry area and flowering plants in the campus. 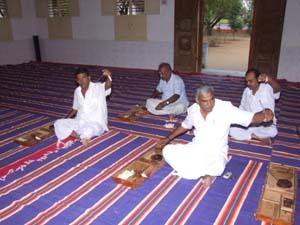 Our teaching staff and Ashram workers actively participated in this programme. 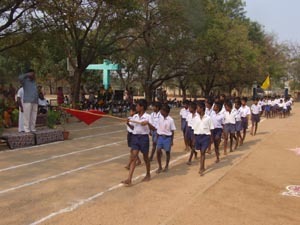 The annual Sports day of the primary school was celebrated on 03.03.2012. 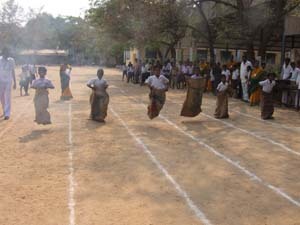 This is the first time the primary school is having its own sports day and its also possible that this is one of the very few schools or only school which is celebrating is the sports day at primary level. 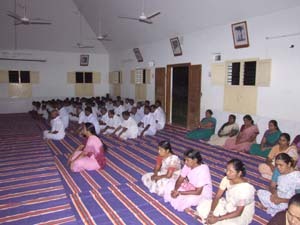 The programme was started with the prayer. 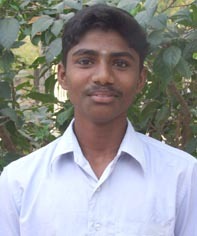 The Headmaster Mr.Nagajothi gave a welcome addess. 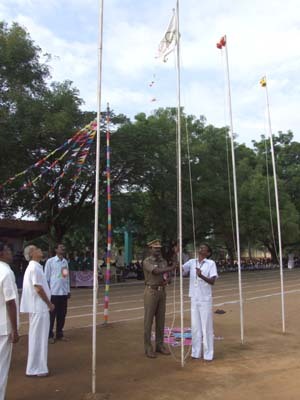 Mr.S.Balakrishnan of the Education Department hoisted the National flag. 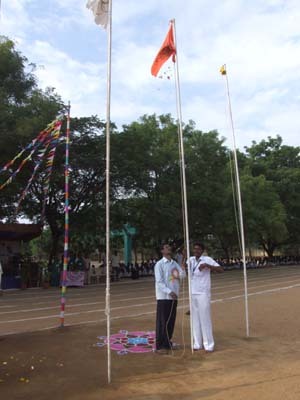 Olympic flag, The Ashram flag and The School flag were hoisted by Mr.Muthaiah of SSA T.Kallupatti, Ms.Radha our Administrative Officer, and Ms.P.Thilagavathi our Hr.Sec.School Headmistress. 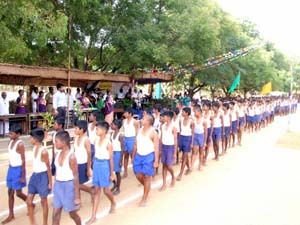 This was followed by an impressive March past by students from IV and V STD and the salute was taken by Mr.S.Balakrishnan. 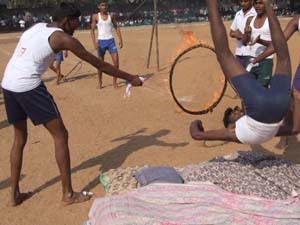 Following this the Olympic torch was brought by six of our students in a relay from Gandhimandabam to play ground. It was a sight to see a torch been carried by the young kids accompanied on either side by 2 of our teachers Ms.Parimala and Ms.Vijayarani in the two wheelers. 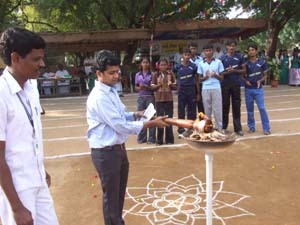 Mr.S.Balakrishnan lighted the Olympic torch marking the beginning of the events. 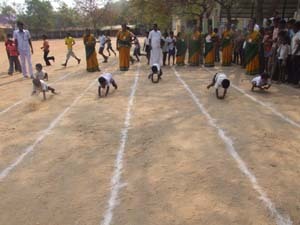 The track events were, namely 50mtrs, 100mtrs, Race, frog race, sack race. 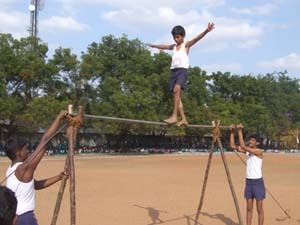 Skipping, walking with lemon and spoon, hidden needle, balloon burst etc., were for students of 3rd , 4th and 5th standards. 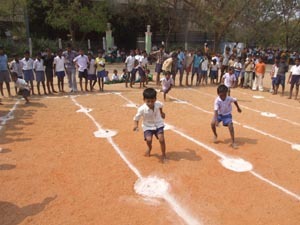 For the Pre basic and first standard students Potato race, ball and bucket and tails matching games were conducted. All the events were cheered by one and all assembled there. 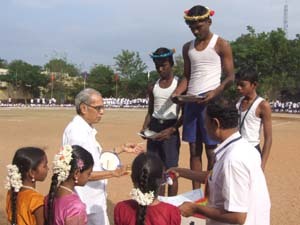 It was sight to see the small kids like butterflies flying all over and winners were brought to victory stand and honored with prizes. Another highlight event was fast walking and lucky corner conducted for the school teachers and teacher training students. 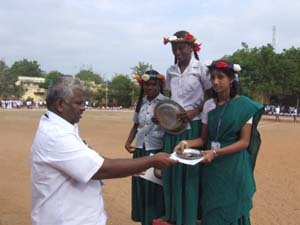 The winners are honored with prizes by school headmaster. 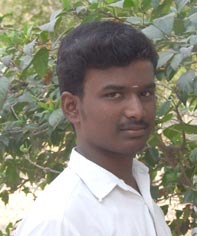 Finally our school Asst. 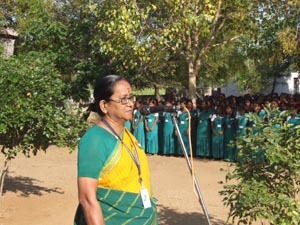 headmistress Mr.Parimala gave vote of thanks and the day came to a close with National anthem. In our campus we have a beautiful small temple for Shree Lord Ganesh. This was built 12 years ago. 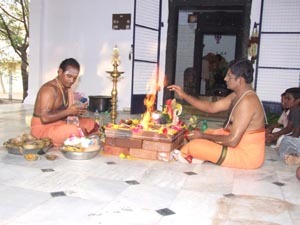 This year we renovated the entire temple after conducting the needed Homam and rituals. 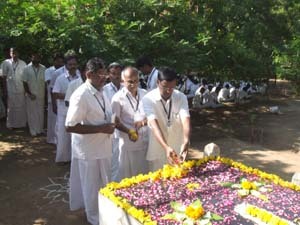 The ashram community participated in the function. 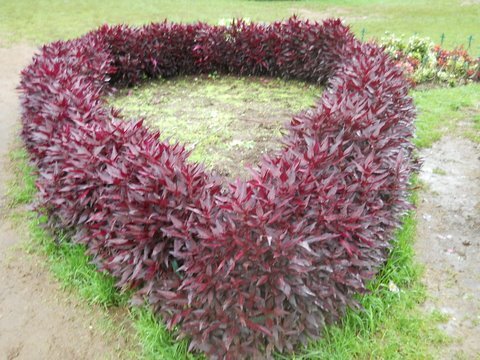 It was like a mini kumbabisekam. 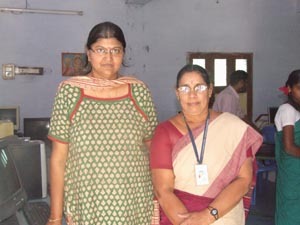 Mrs. Valli Alagappan along with other members of Mr. Arunachalam Trust visited our Ashram. 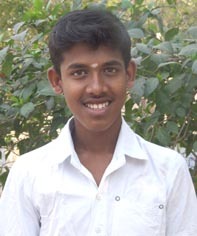 Their Trust is running schools, Nursing college, life skills training institution and village service activities. They showed keen interest in our activities and appreciated the entire atmosphere and expressed their desire to send their school children for a visit. There is a proposal to have a tie up with their Nursing College. 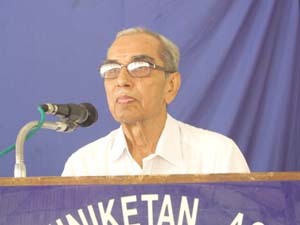 Science exhibition in connection with our founder’s day was inaugurated by Honorable Justice G.M.Akbar Ali at 4.30pm on 26.07.2012 in our school auditorium. Our chairman welcomed the chief guest and others. 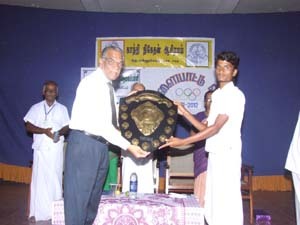 The chief guest stressed on the discipline and learning throughout life by the students. 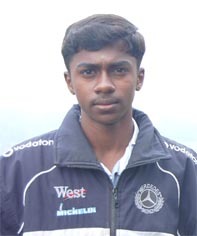 He took himself as an example of how a boy from village background can come up in life. The science center at Trichy helped us in a big wall. Our students showcased their innovations in the auditorium. The chief guest visited all the students made a visit and enjoyed the findings and creations of our students. Finally vote of thanks delivered by our students.